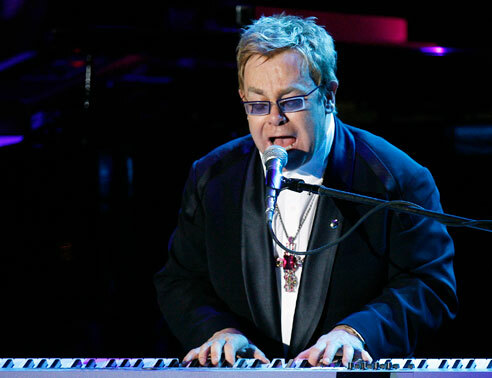 English singer-songwriter Sir Elton John has been performing now for 4 decades. He is one of the most successful artists of all time selling over 250 million records. He has had 50 Top 40 hits which include a string of 7 consecutive #1 hits in the U.S. alone. He has won 6 Grammys and an Oscar and was inducted into The Rock N Roll Hall of Fame in 1994. Elton John had huge success in the 80's with his 1983 album "Too Low For Zero" as well as a string of singles. Some of Elton John's 80's top hits were, I'm Still Standing, I Guess Thats Why They Call It The Blues, "Little Jeannie" (number 3, 1980), "Sad Songs (Say So Much)" (number 5, 1984), "Nikita" (number 7, 1986), a live orchestral version of "Candle in the Wind" (number 6, 1987), and "I Don't Wanna Go On With You Like That" (number 2, 1988). His collaboration with Dionne Warwick, Gladys Knight, and Stevie Wonder on a song called "That's What Friends Are For" became his highest-charting single (number 1, 1985). In 1988, he performed five sold-out shows at New York's Madison Square Garden, giving him 26 total to date. Don't miss out on your chance to see this great performer.